Our 10 ft x 10 ft Booth. 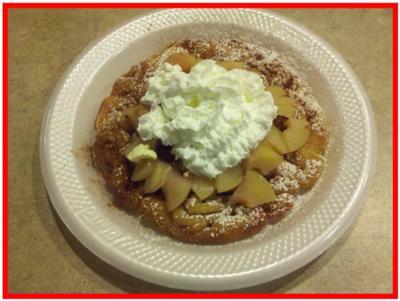 Apples and Cinnamon Funnel Cake. 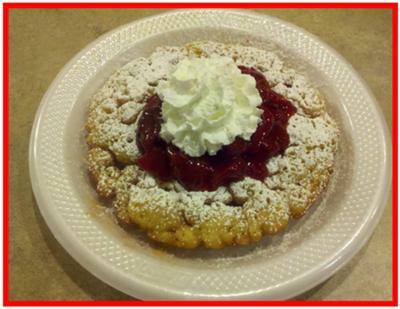 Strawberries and Cream Funnel Cake. 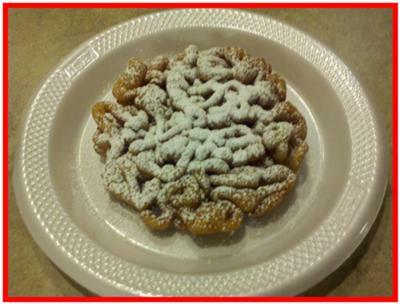 Fair Confections LLC is a food service vendor providing delicious, cooked to order funnel cakes, cotton candy, fresh squeezed lemonade and hot cocoa at local events, fundraisers and fairs. 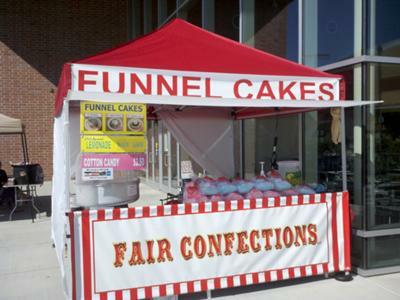 Our brightly colored, circus themed booth adds an element of excitement to any event and is sure to draw a crowd. Using only the finest ingredients in our products keeps our customers coming back for more. We are registered to do business in Washington and comply with all event, city and county health ordinances. Take a look at our website at www.fairconfections.com to see more photos of our booth and products. We look forward to talking with you about your event. Please feel free to contact us any time by email or at the number listed below. We are willing to do events anywhere in Washington state. We would be happy to answer any questions you may have.